Derrynaflan is a small island of dry land situated in a surrounding area of peat bogs, in the townland of Lurgoe, Co. Tipperary, northest of Cashel. The monastery was an important foundation in the period preceding the Viking raids; the present modest ruins of a small Cistercian nave-and-chancel abbey church there, however, date from a later period. The Derrynaflan Hoard was discovered on 17 February 1980 by Michael Webb from Clonmel and his son, also Michael, while they were exploring the ancient monastic site of Derrynaflan with a metal detector. They had not sought permission from the owners of the land beforehand. The site was a National Monument, and digging on it was an offence. The discovery was initially kept secret for three weeks but eventually led to the replacement of Irish laws of treasure trove by the law in the National Monuments (Amendment) Act, 1994, with a new Section 2 being included in the legislation. The Ardagh Chalice dates from around the same period, perhaps a century earlier, of the Derrynaflan Hoard and was found close by in neighbouring County Limerick. 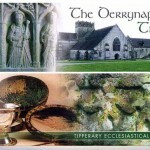 At the time, the ruling dynasty in Tipperary and most of Munster were the Eoganachta, while their longtime allies and possible cousins the Ui Fidgenti ruled in the Limerick area.Feidlimid mac Cremthanin, king-bishop of Cashel, who became King of Munster in 821 and died in 847, was a patron of the monastic foundation at Derrynaflan and has been suggested as a possible patron of the chalice. Like the Ardagh find, the hoard from Derrynaflan, Co. Tipperary, may also have been concealed during the Viking Age, possibly during the early 10th Century. In much of its decorative details, the Derrynaflan Paten is comparable to the Ardagh Chalice and may be a product of the same workshop. Dating a century later than the paten, the Derrynaflan Chalice is less ornate than its counterpart from Ardagh. While the decorative scheme is similar, the elaborate coloured glass and silver inlaid studs of the Ardagh Chalice have been replaced on the Derrynaflan vessel by plainer studs of amber. A decorated strainer-ladle made around the same time as the paten was also part of the Derrynaflan Hoard and was probably used for symbolic purification of the Eucharistic wine. As a masterpiece of Insular art, the Derrynaflan chalice was included in the exhibition “The Work of Angels: Masterpieces of Celtic Metalwork, 6th–9th Centuries AD” (London, 1989, included in the catalogue). The Derrynaflan hoard is on permanent display in The National Museum, Collins Barracks, Dublin 1. 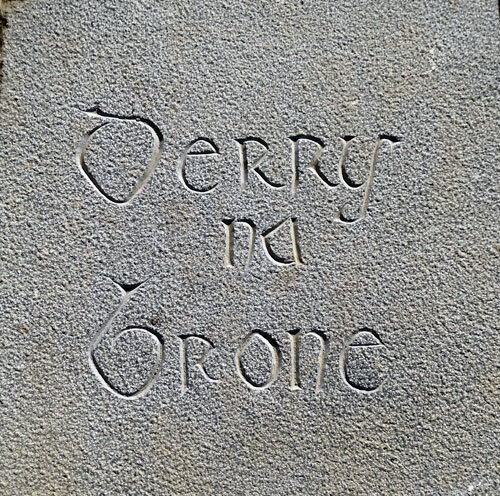 A stone slab was found in Derrynaflan with the inscription “or doan main dubscull” meaning “a prayer for the soul of Dubscuile”. 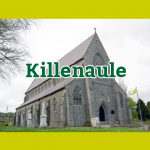 Dubscuile was MacCinaeda who was a successor of Colum Cille, died in 964. This stone slab is now in the National Museum of Ireland. 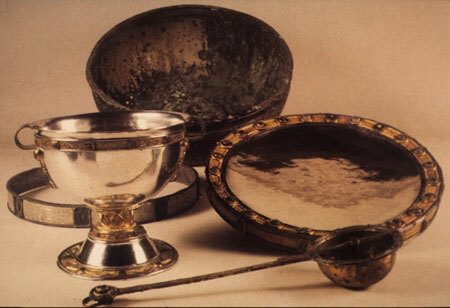 Derrynaflan Hoard of five liturgical vessels. The discovery was made on 17 February 1980 near Killenaule South Tipperary in Ireland. According to art historian Michael Ryan the hoard “represents the most complex and sumptuous expression of the ecclesiastical art-style of early-medieval Ireland as we know it in its eighth- and ninth-century maturity.” The area known as Derrynaflan is an island of pastureland surrounded by bogland, which was the site of an early Irish abbey The chalice was found with a composite silver paten, a hoop that may have been a stand for the paten, a liturgical strainer and a bronze basin inverted over the other objects. The Derrynaflan panel is probably the most detailed panel. 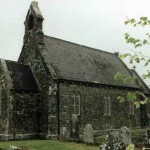 It features beaded detailing from the arched church window in Derrynaflan. There are details from two of the knot-work panels from the paten found in the Derrynaflan Hoard. 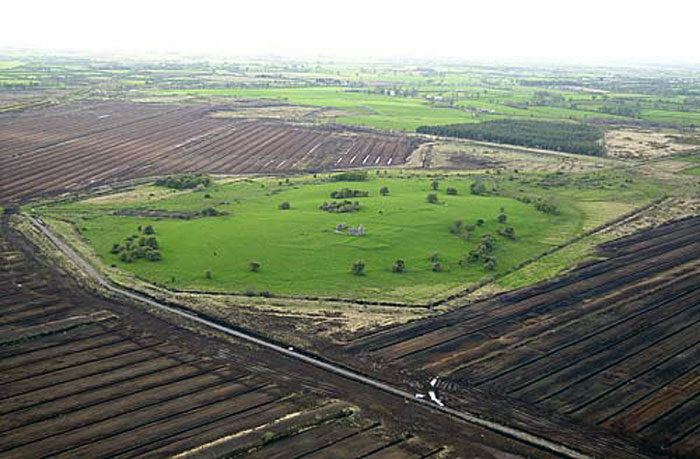 One of these features a beast – this represents a legend relating to the bog: this bog was once a lake inhabited by a monster which a Leinster hero named Fer Domuin cut in two with his sword at the cost of his own life. Also featured on the panel is the cat with two tales – this was the symbol or the Mason’s Mark of An Goban Saor, a well-known stone-mason from the time who is said to be buried at Derrrynaflan. The simple head featured on the panel and the circular symbol are both taken from the stone said to be the grave-stone of An Goban Saor. Daire Eidneach translates as Ivied Oak-Grove, which gives a good picture of how the island in the bog would have looked. We’ve included an oak leaf and an ivy leaf to represent this image. Also included is the image of an ox pulling a laden cart. This comes from a description in one of the Latin Lives of St Ruadan of Lorrha. Bishop Columbanus sent Ruadan and his monks a present of a cask of butter in a cart drawn by two oxen, for whom a wide firm path miraculously appeared through the great bog of Lurga which lies between the two churches. The miraculous road was never seen again, but the butter sufficed for Ruadan, his hundred and fifty monks, and their guests from the beginning of spring until Pentecost, and was miraculously replenished on Pentecost Sunday. 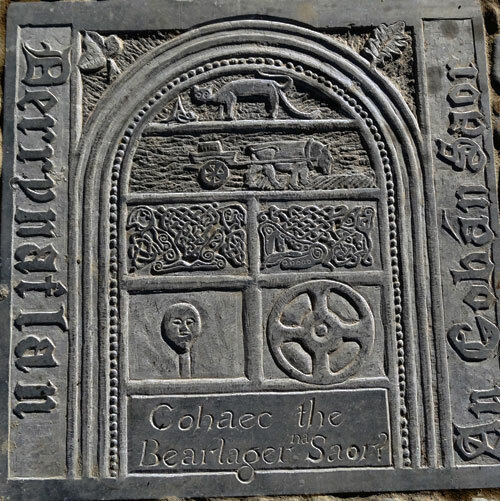 The inscription “Cohaec Bearlager Na Saor” refers to the language used exclusively by the masons – “Do You Speak the Language of The Masons”. Kilboy, also known as Perry’s Well. 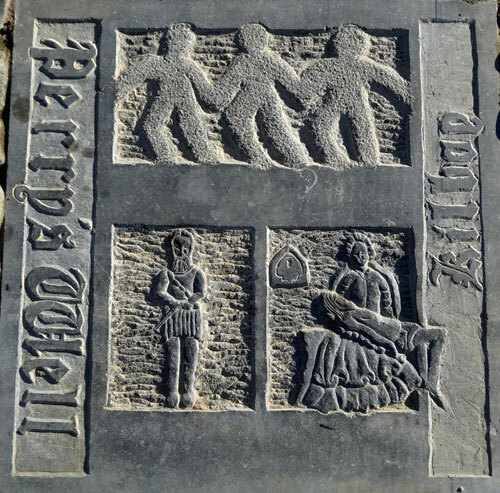 The image of the three simple figures is copied from a stone built into the wall near the well and represents the Trinity. The original stone can still be seen at Perry’s Well. Also at Perry’s Well is a carved Pieta, which is thought to have originally belonged to the ruined church at Kilboy and is now lying flat on the ground. This was probably placed here in the late 19th Century. Standing outside the Well up to the middle of the last century was an iron figure. There is a very vivid description and a photo in The Journal of the Royal Society of Antiquaries of Ireland, published in 1912. The figure was of an old man, with a flowing beard and it was thought at the time to have been a statuette of a local celebrity, perhaps a figure made for a tomb. The stone carving of the Pieta was defaced and it is believed that the iron statue was left at the Well as an act of atonement. Sadly, this figure is no longer at the well and his whereabouts are unknown. 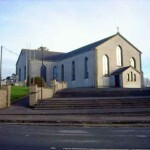 Teampeall Loiscthe or Burnchurch was known to have been a church of the Knights Templar. The skull and crossbones was a symbol of the Knights Templar. 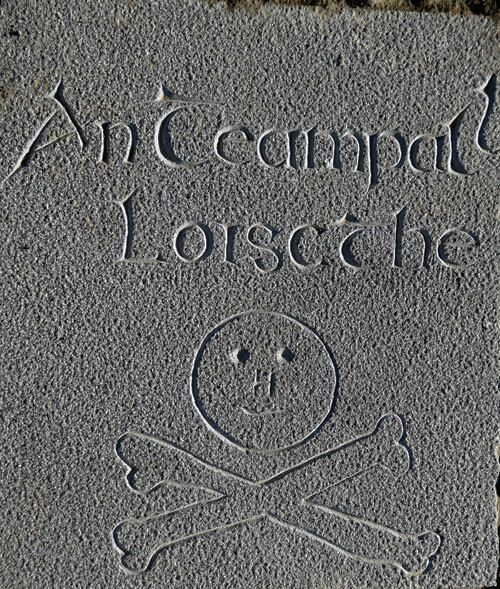 The skull and crossbones used was copied from a gravestone close to the shores of Lough Derg in North Tipperary. Derrynabrone translates as “Oak Wood of the Sorrows” and is the bog island next to Derrynaflan. It is known locally as Whort Island.